Domestic acoustic safety flooring specifically designed for housing. 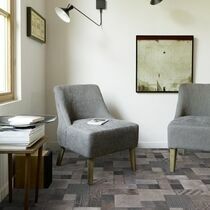 Agrippa is a beautiful and practical slip resistant vinyl ﬂooring with cushioned foam backing, making it comfortable underfoot with an outstanding sound rating of 19dB. It is slip resistant meeting HSE guidelines and is has a hygienic and easy to clean Pureclean surface that doesn’t trap dirt and needs less water and detergent to clean. This slip resistant flooring is suitable for the whole home.